Well done. Those were the words the Lord spoke to William Denham (Bill) Winn when he met his Lord and Savior in heaven on January 27, 2019, leaving behind a legacy of faith for his family and friends. Bill was born to Audie Mae Denham Winn and Lewis Edwards Winn on August 25, 1927 in Laurel, Mississippi. Born at home, a minute after his twin sister, Nannie Elizabeth (Betty) Winn, each baby weighed over seven pounds. Bill always joked that he was named “after” his sister and enjoyed the fact that she was older. The twins joined brother Lewis, Jr. in the family. A second brother, Dawson, was born when the twins were 18 years old. Inseparable, Betty took care of Billy, taking notes for him in school and even asking other children to move in Sunday School if there wasn’t a seat beside her for Billy. Billy and Betty accepted Christ at age 9 and were baptized at the same time on the very long arm of Brother Gates at First Baptist Laurel. Following the Lord became an integral part of Bill’s life from that time forward. Bill enjoyed Boy Scouts, a paper route and special trips with his dad to New Orleans to sell cars where they ate at Morrison’s Cafeteria and then rode the train home. His love of music and singing began at an early age and continued throughout his life. Drafted into the army at 18 he served for 13 months during the occupation of the Philippines post World War II. Afterwards, he used the GI bill to attend his beloved ‘Ole Miss, and joined the ROTC to have enough money to finish school, never thinking he would be called again to military service. But, the Korean War began and his unit was called up. Stationed at Sandia Air Force Base in Albuquerque, New Mexico, he was given the highest security, “Q” clearance, for his job on top-secret military work. The move to Albuquerque was the best thing that ever happened to him because, in the singles department at First Baptist, he met the love of his life, Grace Schneider, a teacher from Plainview, Texas. Their first date was on October 31, 1953 and they dated just a short while before, Bill asked for her hand in marriage in January. A month or so later he took a job in Maryland and didn’t see Grace again until the week of their wedding. Bill married his beloved Grace on June 20, 1953 at First Baptist Church, Plainview, Tex. The wedding was the first time Grace met her future in-laws. The couple settled in Maryland where Bill worked for a chemical warfare plant. In later years, when anthrax was in the news, Grace was surprised when Bill commented that he’d been inoculated for anthrax because of his work there. After a short time in Maryland, Bill worked in Joplin, Missouri before taking a job in 1955 as a chemical engineer with Ethel Dow (later Dow Chemical) in Lake Jackson, Texas. Two sweet additions to the family came in Lake Jackson with the births of Laura Kathryn and Nancy Claire. In his early years at Dow, Bill was part of a group that helped convert the chemical plant to computers, telling Grace that he knew that was where the future was going and he wanted to be a part of it. That experience began his lifelong love of computers, gadgets and new innovations. One day he told Grace they had something new at work called a microwave oven and he was going to get one. She had no idea what it was and really didn’t think she needed it - until he brought it home and she loved it. An “early adapter,” he was always the first to have the newest computer, I-pad, cell phone, or Apple Watch and he spent hours working on them. For the grandkids there was something comforting in knowing that in the quietness of the early morning they could find PawPaw in the same spot, working on his computer. 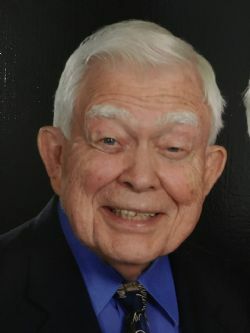 For the more than 60 years they lived in Lake Jackson, Bill was an active member of First Baptist Church, serving at the church’s beach mission called The Anchor, working at various times with singles, teenagers and two year olds, and serving as a deacon. A long time member of the choir, Bill occasionally sang solos in his strong bass voice. Bill served with Junior Achievement, was a proud member of the Gideon’s and volunteered at the Texas Port Ministry, welcoming and ministering to sailors docking at Freeport, near Lake Jackson. Bill retired in 1985, but did contract work for Dow for the next few years. Believing in following the Lord wherever He led, Bill and Grace went to the Philippines in 1990 to work as International Service Corps volunteers with the Southern Baptist International Mission Board. In the following years they served for extended periods of time in Mali, The Ivory Coast and Kenya, with Bill using his computer skills to work in those mission offices. The couple had so many crazy adventures during those years that the grandkids joked that they were probably secret agents. Adventurous, Bill was always planning the next trip when coming home from one. From China to Kenya to Israel to Peru, he and Grace traveled the world. Many of their trips both in the States and overseas were missional. Bill wanted his children and grandchildren to enjoy traveling too and so there were extended family trips in the States and overseas. One special memory is Christmas in southern France while Kathy and Glen and girls were serving in Kenya as missionaries. Bill wanted everyone to be together and so arranged a house and flights for all the family to come. All agree it was the most special Christmas ever. A generous man, Bill once bought each one of his granddaughters a full gallon each of Blue Bell ice cream to eat all by themselves. He also made sure all his grandchildren’s college education was paid in full. In his spare time, Bill enjoyed spending time carrying on his father’s expertise of caning chairs, refinishing furniture and woodworking. He even helped grandson Will engineer and build a prize-winning pine derby car that creamed the competition and brought home an enormous trophy. Married to Grace for more than 65 years, he called her “amazing Grace” and was quick to hold her hand, give her a quick kiss, bring her flowers and give her the first bite out his ice cream bar. He carried lemon drops in his pocket for her to have just in case she began to cough. He commented often on how pretty she is and his favorite story to tell was that the headline on the story of their wedding in the Laurel Leader Call read, “Laurel Man Marries Texas Beauty.” He was so proud of his Texas Beauty. From corny jokes to the antics of great-grandchildren to telling funny stories with friends, Bill laughed often and his laugh was big and infectious. He took great delight in making kazoos out of straws and entertaining the grandchildren, much to Grace’s dismay. Nieces, nephews and grandkids all enjoyed coming to the Winn’s house – trying to figure out Bill’s “two little Blackbirds,” playing games, fishing in the creek behind the house, going crabbing and to the beach. With his twin Betty, Bill shared a great love for ice cream, especially Blue Bell. He could never pass an ice cream shop without stopping in and always had a freezer full at the house. Granddaughters Laura and Bethany remember eating gelato three times a day – every single day – on a trip to Europe. The competitive streak carried over into his tennis game, which he played well into his 70s, and to his beloved, Ole Miss. He would hoop and holler and root hard on Saturdays for the football team. Bill never met a stranger. He loved people and would easily strike up a conversation with anyone he met, making friends easily. With family and friends he gently rested a hand on your back or shoulder to let you know he cared and he would wink and point his finger at you, as if he were “shooting his love” across the room to you. Expressing his love for his family and for his Lord were the two things that brought tears to his eyes. When sickness took away much of his ability to communicate, and he couldn’t say much else, Bill still quoted his beloved John 3:16, continually reminding the family that God is good. In the hospital right after the stroke, even though his words were somewhat garbled, he wanted to make sure his nurse knew about Jesus. Not a perfect man, Bill Winn delighted in a perfect Savior, which resulted in a life lived well. He passed on his faith to the next generation and that legacy lasts through what he modeled about his Lord to his children, grandchildren and great grandchildren. That will last for eternity. We will see him again. That’s why we celebrate today. Bill was preceded in death by his parents, his beloved twin, Betty Rhymes, and brothers Lewis Winn and Dawson Winn. He is survived by his loving wife, Grace Schneider Winn, daughters Kathryn Smith and husband Glen of Belton, Texas and Nancy Peevy and husband Gary of Rogers, Arkansas. He is “PawPaw” to Sara Beth Robertson and husband Andrew, Emily Mylabathula and husband Sagar, Laura Smith, Bethany Peevy, Will Peevy and wife Elizabeth, and to seven great grandchildren – Hannah Robertson, Benaiah Robertson, Aletheia Robertson, Joshua Robertson, Nathanael Robertson, Abigail Mylabathula and Selah Mylabathula. Services will be held at First Baptist Lake Jackson on Thursday, January 31 at 10:00 a.m. with visitation at 9:00 a.m. until the service begins. A memorial service will also be held at 3:00 p.m. on Friday, February 1, 2019 at The Meridian in Temple, Texas where Grace and Bill now live. In lieu of flowers, please consider a memorial to Gideon Bibles or First Baptist Lake Jackson mission fund.